Getting station placement right is integral to the success of a bike share system. NACTO’s new guide allows planners and community groups to help design and advocate for better, easy-to-access bike share station locations and safer streets. Bike share has rapidly emerged as a convenient, low-cost transportation option that can not only bolster public transit usage and increase cycling, but also address multiple street design needs simultaneously. Well-planned bike share stations can improve the pedestrian experience, help reduce traffic fatalities, and reduce inequity in cities’ transportation networks. 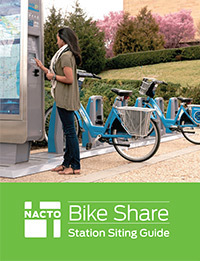 To support cities across the country working towards all of these goals, NACTO has released the NACTO Bike Share Siting Guide, which highlights best practices in station placement and design. Getting station placement right is integral to the success of a bike share system. Planners and community groups alike can use this new guidance to help design and advocate for better, easy-to-access bike share station locations and safer streets. Complete with photos from systems around North America, as well as helpful diagrams and clear technical illustrations, the Guide provides a framework for a new, evolving industry. Developed collaboratively with city transportation departments, bike share experts, planners, outreach specialists, system operators, and equipment vendors from a variety of North American cities, the techniques recommended by the Guide have been proven in real-world practice. The Guide provides concrete options for communities looking to increase mobility options and improve street safety in their neighborhoods. This key reference tool can be used to enhance the community engagement and outreach efforts that are essential to the planning of any bike share system. Getting bike share station placement right is good for more than just bike share users. As cities work to address decades-long issues of equity in street design (low-income people in particular have a disproportionate risk of death or injury caused by traffic crashes), effective bike share station placement and planning can help close the gap by increasing pedestrian visibility at intersections, providing pedestrian refuge areas, protecting bike lanes and pedestrian plazas, and extending the reach of transit. The Guide is a complement to NACTO’s successful Urban Bikeway Design Guide and Urban Street Design Guide, which have set the bar for successful 21st-century multi-modal streets, as well as NACTO’s Equity Practitioners’ Paper series, which highlights best practices for cities aiming to address equity issues while introducing or expanding their bike share systems. The NACTO Bike Share Siting Guide is available in print and as a free download at nacto.org. The Guide is part of a collection of resources created in collaboration with the Better Bike Share Partnership. It is made possible by a grant from The JPB Foundation to further the conversation around equity in bike share. NACTO is an association of 45 major North American cities formed to exchange transportation ideas, insights, and practices and cooperatively approach national transportation issues. Bike share has rapidly emerged as a new transportation option that can bolster public transit usage and increase cycling, with systems in in over 50 U.S. cities. As cities and towns around the country focus on sustainability and equity, bike share systems can play an important role in safety, accessibility, and livability efforts by making it easier for people to get around. To facilitate conversations between peer cities, NACTO holds roundtables, workshops, and webinars and conducts research on best practices and challenges for the growing bike share movement. NACTO is a member of the Better Bike Share Partnership, a JPB funded collaboration between The City of Philadelphia, Bicycle Coalition of Greater Philadelphia, NACTO, and PeopleForBikes, to build equitable and replicable bike share systems. For more information about NACTO’s Bike Share Program, contact Kate Fillin-Yeh, NACTO Bike Share Program Director, at [email protected].